ITC India Nabl Accredited laboratory Providing Environmental Testing Services in India. If you have any query regarding Environmental Testing Services and Certification. Kindly send us your testing requirements with the product technical details to submit you our testing charges. If you have any query regarding LM 79 Testing, Kindly send us your testing requirements with the product technical details to submit you our testing charges. If you have any query regarding Electro Medical Equipment Testing and Certification. Kindly send us your testing requirements with the product technical details to submit you our testing charges. Popular standards for Laboratory and Measuring Instrument Product testing are As per IEC 61010. Electrical control equipment, Electrical microscopes, Power supply, Auto transformer, Electrical laboratory equipment, Signal generators, Transducers, Transmitters Popular standards for Laboratory & Measuring Product testing are IEC 61010. If you have any query regarding Laboratory Measuring Instruments Testing and Certification. Kindly send us your testing requirements with the product technical details to submit you our testing charges. ITC India Electrical Safety Testing Laboratory serve LM-79 Testing Service in Chennai, India. LM-79 Testing is a Conduct of photometric test for LED luminaires. ITCindia document that the photometric laboratory must follow to test LED luminaires. Mostly it tells you how the luminaire must be tested and what instruction must be included in the photometric report. Our Lab is fully equipped with high accuracy measuring testing Instruments and trained personal to provide testing & certification services for different type of products according to IEC Standards. Some of which are IEC 60335--1, IEC 60601, IEC 61010, IEC 60204, IEC 60598, IEC 60950, IEC 61427, BS EN 50262, etc. ITC India has made strides to stay current with the new testing standard LM-79 set forth by the IESNA (Illuminating Engineering Society of North America). In addition, "IN-SITU" testing is now a priority when testing our LED light systems for more reliable results. Fixtures tested by LM-79 standards will now feature a Lighting Facts label provided through the program created by the U.S. Department of Energy. 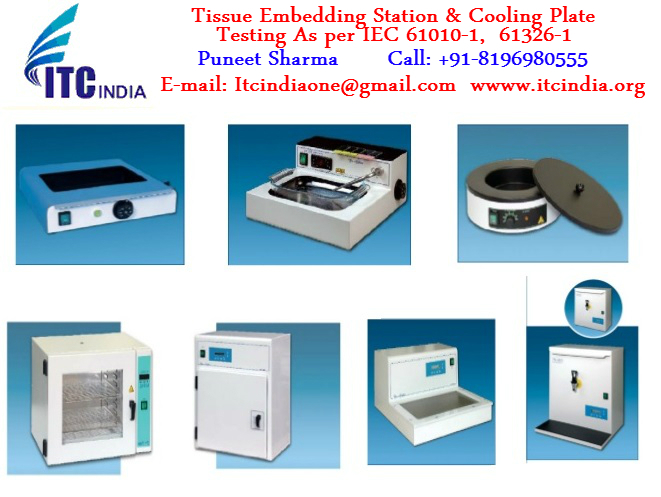 If you have any query regarding Tissue Embedding Station and Cooling Plate Testing and Certification. Kindly send us your testing requirements with the product technical details to submit you our testing charges.